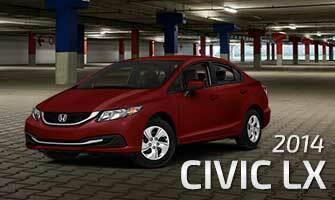 The 2014 Honda Civic has been a popular compact car among Central Illinois drivers, and you aren’t alone. This has been an incredible year for Civic sales. It’s been an incredible year for Accord sales too. Really, this has been an amazing year for the Honda brand thanks to successes from vehicles like the Accord and the Civic. We’ve spent a lot of time talking about the Accord here at Central Illinois Honda Dealers, but as the 2015 Honda Civic finds its way into our showrooms, we thought now would be a good time to look at the 2014 model and see what made it so impressive. The 2014 Honda Civic LX continued to give drivers game-changing standard features without needing to upgrade. The entry-level LX trim comes with Bluetooth, a touchscreen infotainment system, steering wheel-mounted controls, a rearview camera, and so much more. All of it standard. And if you want to upgrade, the options are there. The Civic featured LX, EX, and EX-L trim levels as well as options like a satellite-linked navigation system that can give drivers practically everything they want in an affordable, fuel-efficient, compact sedan. When we say “fuel efficient,” we aren’t joking either. The 2014 Civic LX with CVT earns an EPA-estimated 39 mpg on the highway* making it one of the most fuel-efficient vehicles in its class. But what if you want a hybrid car? You can get it in the Civic hybrid. Looking for a sport-tuned track-ready compact sedan or coupe? You can get that in the Civic Si sedan and coupe. There’s just so much that the Civic is capable of, and if you’re looking for a new car in Central Illinois, we think you’ll be happy with everything it has to offer. And if you liked those features of the Civic, you’ll find them back in the 2015 Honda Civic. Visit a Central Illinois Honda Dealer near you and let us put you in the driver’s seat to see what the Civic has to offer.